Richard Benyon MP, the Minister for Inland Waterways, at Gloucester, together with David Penny from the Canal Trust, announced the above scheme to an assembled audience in Hereford on 12th December 2011. The assembled company included executives from British Waterways and the Environment Agency together with directors and cabinet members of the Local Authorities of both Herefordshire and Gloucestershire. 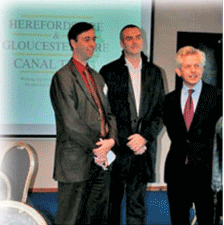 David Penny (left), with Nick Worthington (centre) Regional Manager for British Waterways and Richard Graham (right), MP for Gloucester at the presentation in December introduced by Richard Benyon MP, the Waterways Minister. The day was to permit the Minister to open the Environment Agency’s new flood storage scheme at Horsebere Brook and to launch British Waterways locally as a charity. After the Minister had delivered his speech, he handed over to David Penny to launch the £7m scheme at Llanthony to create a new lock that will also serve as a flood relief channel and a major hydro-electric scheme. As well as being a huge asset to the community residing either side of the River Severn’s route, the scheme is set to earn the HGCT a good return once operational. This is one of the many projects being developed behind the scenes at The Wharf House has been to consider how we progress the Llanthony Lock site given that the work here will be both complex and very costly. It is not simply a question of restoring the original lock and re-excavating the approach channels! It is known that in the latter years of operation the lock was the source of increasing concern regarding its structural stability and that the tidal flows caused major operational problems due to siltation. In evaluation of our options we need to find the best solution for the requirements of gaining access to the H&G Canal (which, of course, was not the prime objective of Llanthony Lock) and to take into account both the capital and long-term operational costs of the chosen solution. As with everything that we promote some ‘lateral thinking’ was called for! Whilst most of our projects are not made public until all the detail has been thoroughly researched and agreed the situation at Llanthony is such that we were reaching a stage where we needed to promote the concept, and develop a partnership, to take what is a complex solution forward as an exciting major project. We have been working on this behind the scenes at the Wharf House prior to buying the Llanthony site 3 years ago. In a previous edition of The Wharfinger we were pleased to announce that Richard Graham, the MP for Gloucester, had become one of our Vice Presidents. In agreeing to take on the role he made it clear that he was very keen to assist the H&G CT whenever there was an opportunity to promote and pursue the restoration of the Canal. At that point he already had an opportunity arising from a proposed Ministerial visit to Gloucester! So in mid December Richard Benyon MP, the Waterways Minister, addressed an invited audience at Gloucester Docks. Those attending included senior representatives at Director level from both Gloucestershire and Herefordshire County Councils, British Waterways, the Environment Agency, and other key parties. Having briefly introduced the proposed Canal & River Trust that will take over British Waterways role in England and Wales later this year, the Minister handed over to David Penny – the only other speaker. David gave an illustrated presentation on behalf of the H&G CT launching the H&G CT’s imaginative £7million Llanthony Hydro-Electric, Flood Relief and new Lock Scheme to the assembled audience. 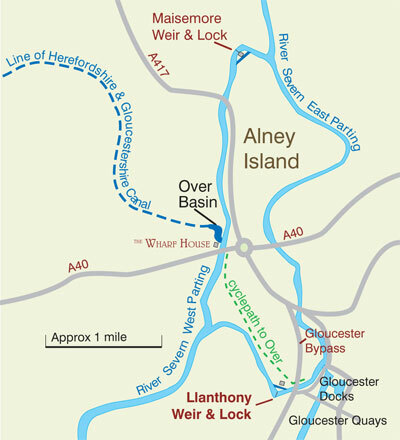 Hydro-electricity generation that will make maximum advantage of the tidal River Severn thus funding H&G CT’s costs in operating and manning the new Llanthony Lock and meeting the long-term energy requirements of the H&G CT along the Canal. A new modern lock at Llanthony to facilitate safe access to and from the H&G Canal. Radial gates on the new lock which, together with the approach channels to and from the lock, will act as a flood relief channel. Inflatable weirs (incorporating new fish passes) at both Maisemore and Llanthony that will significantly improve control and management of the River Severn and greatly benefit this area of Gloucester during major floods. 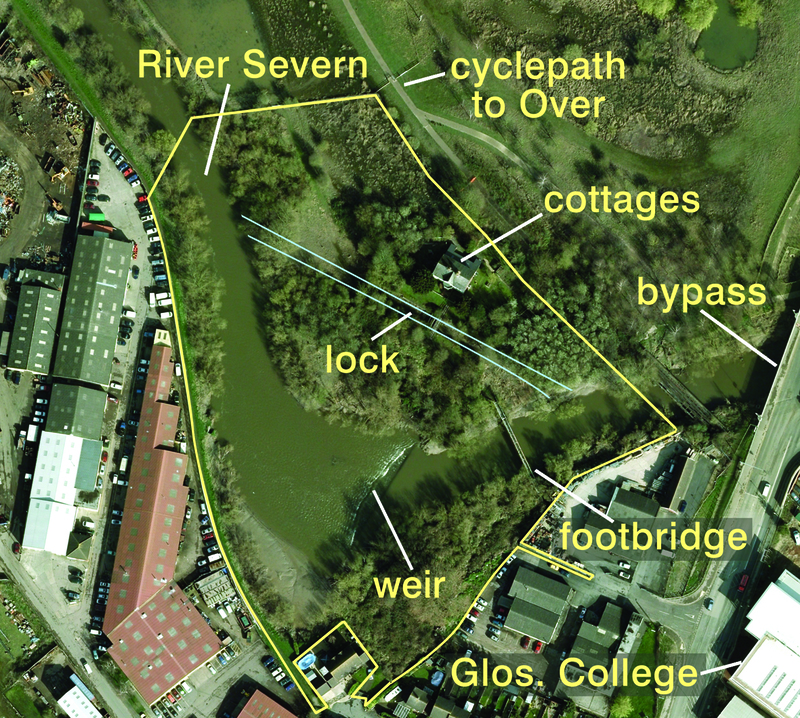 Improved navigation in the Eastern Parting (the only access to and from Gloucester Docks from the River Severn) whilst also minimising tidal intrusion. This will greatly reduce the silt load in the Eastern Parting and on the pumps into Gloucester Docks. This will dramatically reduce silting of both the River channel and within the Docks and along the Gloucester and Sharpness Canal. The proposals will be designed to utilise flood flows to scour accumulated silt from the new Llanthony Lock and approach channels. Some 75% of Bristol’s water supply is extracted from the Gloucester and Sharpness Canal at Purton; the reduction of silt and possible saline in the water will reduce costs by simplifying the water treatment process. A ‘win win’ solution for many interested parties, not just the H&G CT! We already have initial feasibility studies to prove it works. We have already secured what is estimated to be 50% of the costs of Specialist Consultants Reports. We have a partnership with Funding Officers from both Gloucestershire and Herefordshire Council already working together with us to deliver both the balance of the funding and to secure the essential (and many!) next stages. We have Specialist Consultants preliminarily briefed ready to start on design and secure all the necessary Consents. We have frequent and supportive meetings with senior British Waterways staff (at what is a very busy time for them regarding the transition to the new charity). We have the support of key bodies such as the Gloucester Harbour Trustees and Internal Drainage Board. We will be focusing on the continued essential liaison with the Environment Agency and other important bodies, during the next preparatory stages. This is both a major and an exciting project for the H&G CT (the largest – so far!) with the potential to be a ‘win-win’ situation for all concerned. It has to be appreciated that it is still in the formative stages with many hurdles yet to cross. It will take several years to develop and design the proposals to reach the stage where the necessary consents can be obtained.